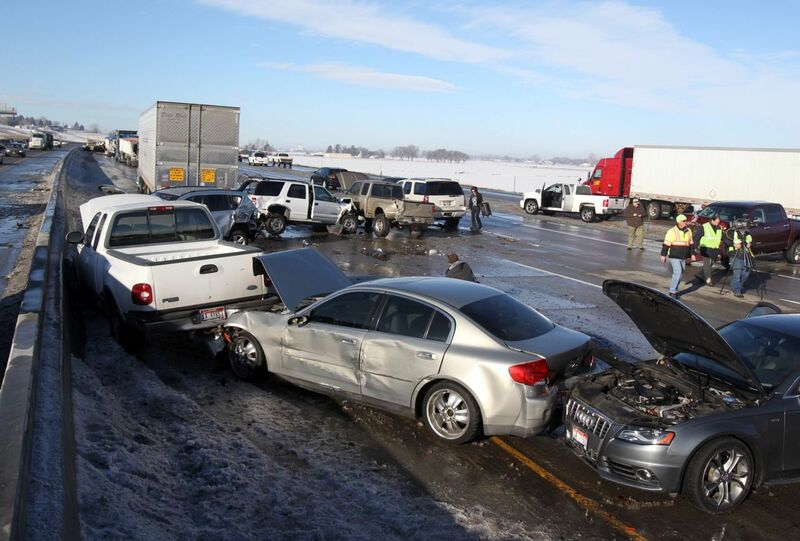 A total of 46 cars were involved in an unusually massive motor vehicle accident on Interstate 84 in the Treasure Valley area of Idaho on Thursday, January 9. The road conditions were reportedly quite difficult for drivers and those conditions allegedly played a significant role in causing the multi car pile-up, which caused significant injuries to several parties involved. News reports indicate that several icy patches on the roadways, combined with thick fog and precipitation in the air, made driving almost unbearable by the time the accident occurred. According to reports, this destructive crash was set off by a chain of events; a passenger car was trying to switch lanes when it clipped another a logging truck and spun out. The logging truck then jackknifed sending some of its logs spilling onto the highway, which then hit nearly every car in sight. State troopers stated at least 10 people were transported to all of the hospitals nearby. After all the vehicles involved came to a halt, the initial logging truck had a car twisted and pinned underneath one of the rear axles. Firefighters on the scene cut into the car and saved the driver who was trapped. Just this like car, many other drivers and passengers had to be cut out of their vehicles to survive and to get more medical attention. Troopers reported that the victims pinned inside their cars will survive with slim to none injuries, and all other drivers not involved in the crash were advised to use alternate exits and to avoid the crash area. Multiple vehicle collisions are particularly deadly as the mass of crumpled cars makes escape for survivors difficult. Even when a survivor is able to escape from their vehicle they could potentially get struck from another oncoming car, having the proper legal guidance is necessary especially if you’ve been injured. A crash with more than a handful of vehicles can make it tough to determine who is at fault and can cause a huge blaming game. Unfortunately no insurance settlements can be paid out until someone admits fault or fault is determined in the court of law. Arguing your way through court on your own can be a difficult task and is a very complex process, hiring an experienced lawyer will only benefit your case. A personal injury attorney can help guide you in the direction you need to go after being involved in a multi-car collision. If you or a loved one has been injured in a motor vehicle collision, there is a good chance that consulting with a personal injury attorney could benefit you financially in the long run. Contact Davis Law Group using the confidential contact form on this page or call us at 206-727-4000 to have your case reviewed during a free legal consultation.